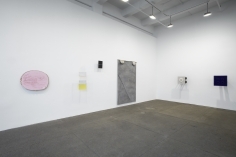 Galerie Lelong is pleased to present Stretching Painting, an exhibition featuring the work of ten artists who engage "supporting" elements of painting, such as the frame, the wall, stretchers and hanging devices, as critical components of their work. Thinking beyond the traditional notion of painting as paint on canvas, many of the artists in this exhibition also expand the possibilities of support. In lieu of using canvas alone, they incorporate and combine hand-woven and hand-dyed textiles, porcelain, and an array of other handmade and found materials in unexpected and exciting ways. 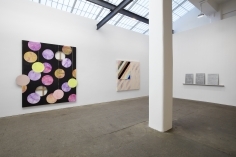 While wide-ranging in their interests and methods, the artists of Stretching Painting all demonstrate a deep investment in materiality, labor, and process, part of a stimulating tendency manifest in all aspects of contemporary culture today. 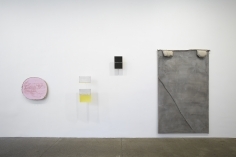 Paintings by Hilary Harnischfeger, James Hyde, and Kate Shepherd featured in the exhibition blur the distinction between surface and support. 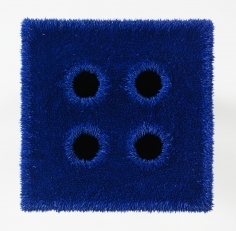 Both Harnischfeger and Hyde present ceramic-based paintings that also confound categorization. 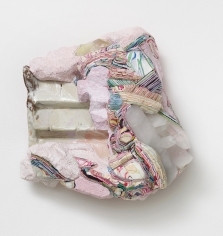 Harnischfeger’s three small wall-mounted reliefs are multi-layered abstractions made of stacked pieces of hand-dyed paper and stones embedded in plaster and ceramic. 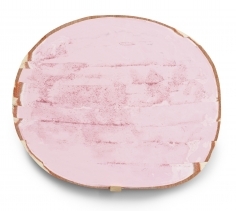 Similarly, Hyde’s diminutive porcelain paintings combine painting, photography, and ceramic in lively, unorthodox ways. 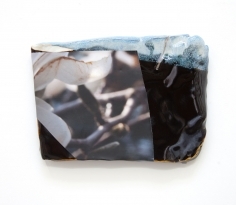 Shepherd presents new work from a series of stained-wood paintings marked by irregular fissures that she refers to as puzzle paintings. In this body of work, surface and support are unified, as the artist extends her investigation of place with line--here cut, rather than painted. 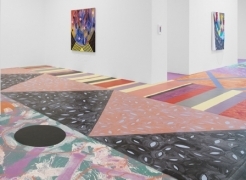 Sarah Cain and Gabriel Pionkowski both deconstruct and reconstruct their canvases. 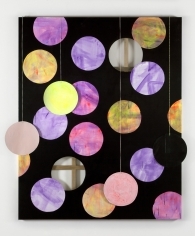 In Cain’s large painting, Balls to the Wall (2012), circles are painted, cut out to reveal the stretcher bar lattice beneath, and suspended from the top of the painting with different colors on their reversible sides. 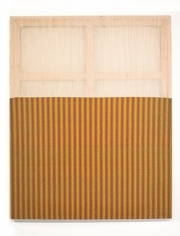 Pionkowski’s process, by contrast, uses a loom. Unraveling canvas into discrete strands by hand, he paints each deconstructed string individually and then weaves the strands back together in a labor-intensive fashion that harnesses the poetic potential of loss and renewal. 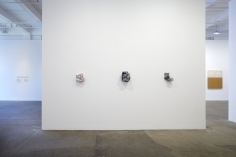 For Donald Moffett, Jim Lee, and Alex Kwartler, the wall and surrounding space of the gallery are as much a support for their paintings as the surfaces upon which they paint. Stretching Painting presents two of Moffett’s newest pipe paintings, canvases covered in thickets of brushstrokes and attached to the wall by industrial pipes, prompted by the artist’s self-professed desire “to get painting off the wall.” Many of Lee’s paintings in the exhibition also extend from the wall or are cut in ways that reveal it. 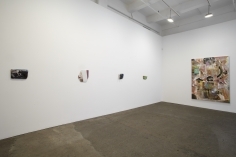 In his work, staples, stretcher bars, and other elements typically relegated to the edges or backs of painting become essential compositional devices. 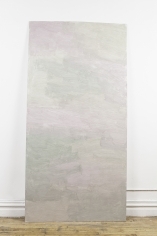 Kwartler’s two recent paintings are made on standard plywood panels purchased at New York lumberyards that the artist painted in large swathes of pink, green, and lavender-tinted Venetian plaster in the fleeting moments before the plaster dried. Belying their modest construction-industry origins, the paintings have a sumptuous presence and deftly fuse support, mark, and surface. Patrick Brennan and Lauren Luloff both use fabric extensively in their large paintings, which they construct piece by piece like collages. 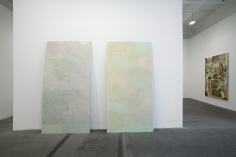 In Brennan’s Boomtown (2012), the canvas is a support for eclectic materials including hand-dyed store-bought fabric, but also for three smaller paintings that he affixed to the surface. 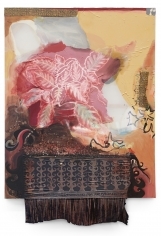 Luloff’s painting, Flame Violet and Golden (2012) is composed of torn bed sheets and other fabrics that she painted and bleached with patterns inspired by objects in her studio and traditional Indian block print textiles. Although the painting appears loosely rendered, it requires the same meticulous investment of labor as the Indian textiles she invokes. 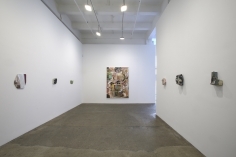 In treating painting as a hybrid, open practice that combines elements of painting, sculpture, collage, and installation art, the artists in Stretching Painting extend a distinguished historical trajectory associated with minimal and post-minimal art, while expanding our sense of what painting can be. 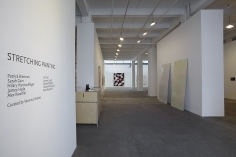 Stretching Painting is curated by Veronica Roberts, a New York-based curator and Sol LeWitt scholar. Her recent exhibitions include Eva Hesse and Sol LeWitt at the Craig F. Starr Gallery, New York (2011) and Lee Bontecou: All Freedom in Every Sense at the Museum of Modern Art, New York (2010).